After damaging claims concerning the UKIP leader’s credibility appeared in the Times on Thursday, Nigel Farage is facing further calls to step down. The latest calls come from the biggest UKIP party donor Stuart Wheeler who told the BBC on Thursday he thinks Farage is “too aggressive” and “divisive” to successfully lead the party through an EU referendum. Patrick O’Flynn, UKIP MEP for the East of England, is the first in the party to hint at factional divisions which have emerged in the wake of the general election, with the party’s only MP Douglas Carswell pitted against Farage in a squabble over funds. “I don’t think the way he resumed his leadership was done in the right way. And I think in the crucial in/out referendum, which it looks as if we’re going to get, I think that all the people who voted UKIP in the election will vote to leave the EU. “A rather quieter approach would be a better method than the method by which he’s become so well-known and popular, which is highly effective, but I think it’s now time for something quieter,” he added. Two leading figures in the party, Farage and Carswell, are currently embroiled in a row over the £650,000 public funding UKIP receives as a party of opposition. Carswell, UKIP’s sole MP and Tory defector, said it would be “completely inappropriate” for him to use the funds to hire 15 members of staff for his office, and has suggested he choose how best to use the money. The two men did not resolve the conflict at a meeting on Wednesday. O’Flynn said that since the election Farage had behaved poorly as a leader. “What’s happened since Thursday night, Friday morning has certainly laid us open to the charge that this looks like an absolutist monarchy or a personality cult,” he said. “I don’t think that even Nigel would say it’s been the most glorious chapter of his leadership. “The team around Nigel himself need to reflect why it was that Thanet voted in a UKIP council but didn’t vote in Nigel as the MP for Thanet South,” he added. There has been speculation that Carswell may even leave the party after the money row. A spokesperson said the negotiations were ongoing. Should he decide to leave the party, he will lose the £650,000. Speaking on BBC Radio 4’s Today program on Wednesday, Carswell said: “There are one or two rather excitable staffers in UKIP who came up with a proposal that involved hiring 15 extra people. “I mean, I’m not an American senator. I doubt that even Ed Miliband when he was leader of the opposition would have had 15 staff in his office. 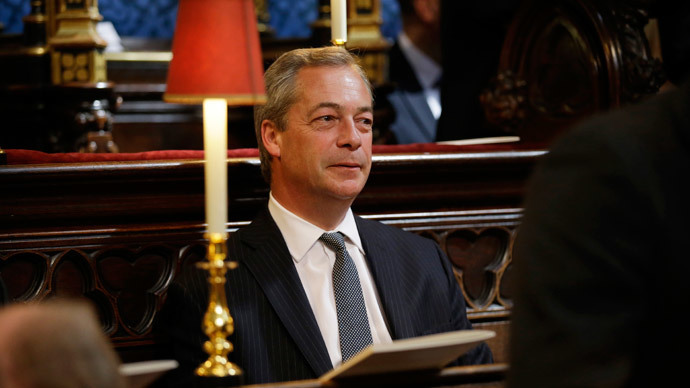 “UKIP is meant to be different and UKIP is going to be different. And I think we need to make it absolutely clear that when we spend money, we are doing it because it is the right thing to do, not just simply because the money’s there,” he added.